By Randall Rowe, PhD Student, Department of Slavic and East European Languages and Culture, The Ohio State University. 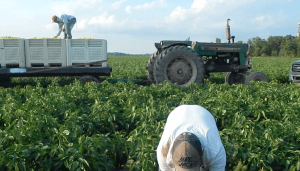 A migrant’s journey often starts due to reasons outside of his or her control. The catalyst for uprooting one’s life can be economic, political, cultural, or indeed all three of these combined. For Queer migrants from Russia and the former USSR, the journey from their homeland to another country often began due to the violent and ubiquitous nationalism propagated by Vladimir Putin’s Kremlin. The Russian President’s administration advocates for Russian moral superiority, which promotes homophobia in an effort to differentiate Russian society from ‘Western’ societies. The sentiment of his administration’s policies with regard to LGBT Russian citizens are fairly summed up in the so-called ‘Gay Propaganda’ law of 2013, which prohibits talking positively about “non-traditional” lifestyles. 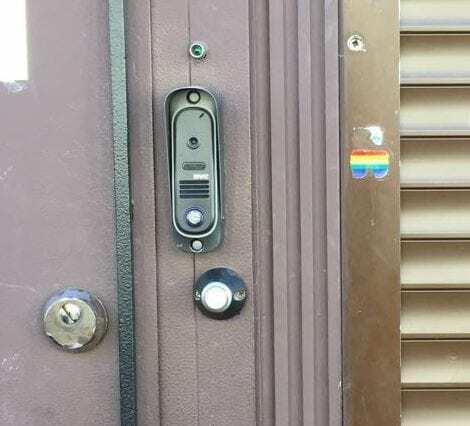 “Rainbow Flag Sticker on Door.” Photo taken by researcher on 5/6/2018 in St. Petersburg, Russia. A Russian colleague delivered a warning to avoid this bar because those with “non-traditional” sexual orientations go there. Thanks to a grant from the Global Mobility Project, I was able to speak with a number of Russian-speaking immigrants from the Russian Federation and the former Soviet Union whose experiences have been shaped by major forces such as queerness, migration, and nationalism. In these interviews, I found themes that contrasted with the more conventional narratives surrounding LGBT migrants. In the past, I have analyzed media coverage of these migrants and their experience; by contrasting this coverage with the interviews, I have observed a dialogic relationship of Queer identity formation through migration experiences and news media representations in Russian and America/Western European outlets. Moreover, within this dialogic relationship, contradictions that obscure actual lived realities arise. For example, some of the Russian speaking immigrants, with whom I spoke, noted a tension in having to adopt a victim narrative as an LGBT immigrant from the former Soviet Union due to expectations fostered by media coverage. Additionally, concepts of self are challenged when they are taken out of their original cultural context and renegotiated in an American context with American English lexicon. Research examining cultural productions and political utilization of the “Other,” or those who are perceived to exist outside the constructed societal norms, in the Soviet Union and the Russian Federation has been carried out by scholars such as Stephen Hutchings, Barbara Heldt, Nancy Condee, Stephen Norris, Judith Mayne and others. Though scholarship has addressed the “Other” to the Russian “I,” specifically how the “I” is foregrounded against the “Other” in a variety of ways, little has been done to specifically illuminate the circular relationship of media representation and lived experiences of LGBT migrants from Russia and the former Soviet Union. Going forward, I am seeking to uncover the extent to which this dialogic relationship shapes personal expectations, identities and, in turn, media representations. When compared with media representations of the experience of LGBT migrants, my interviews have managed to offer a more nuanced perspective of Queer migration from the former Soviet Union. This is an article from a popular travel blog that was published on 7/2/2018. 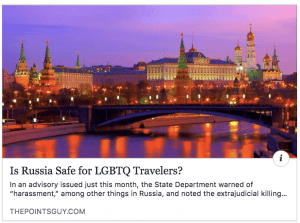 This question is valid, however it relies heavily on the narrative that says LGBT people are in danger when they go to (or live in) Russia. 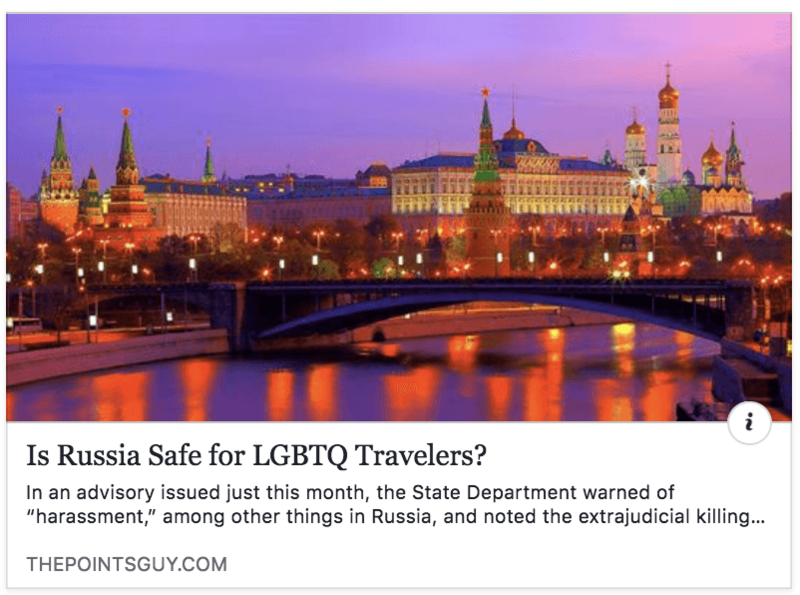 This narrative is carried in much of the media coverage and it often gets attached to LGBT immigrants from Russia and the former Soviet Union regardless of their actual, lived experience. Screen shot taken on 7/3/2018. Many LGBT individuals whose lives are complicated or interrupted by the effects of nationalism and its harmful exclusivity have decided to sacrifice their prior lives in order to move to another country. 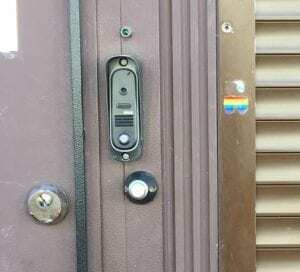 Migration is difficult enough without considering the particularities of identifying as LGBT. By taking one’s sense of self out of its original cultural context, and bringing into contact with another cultural context, the migration experience shows how identities are negotiated. This negotiation may undermine official narratives found in mass media or government rhetoric, because these narratives emerge, in part, due to foreign policy goals. Thus, these narratives tend to ignore reality in favor of generalizations and assumptions. The instability of categories like Queer, migrant, nationalism, LGBT, etc. exposes problematic aspects of government policies, cultural productions and, most pertinent to this project, media representations; namely the conflict between essentialized categories used in the policies, productions, representations and the fluidity of identity. In order to better understand the situation, and perhaps, to better aid these LGBT migrants in their journeys and goals, further research into the real, lived, migration experience of LGBT Russians should be done so to cut through bias or false depictions. Cohen, Cathy J. “Punks, Bulldaggers, and Welfare Queens: The Radical Potential of Queer Politics?” GLQ 1 May 1997; 3 (4): 437–465. Healey, Dan. Russian Homophobia from Stalin to Sochi. Bloomsbury Academic, 2017. I use the term ‘Queer’ in the way that Cathy Cohen has defined it in her seminal essay, “Punks, Bulldaggers, and Welfare Queens: The Radical Potential of Queer Politics?” She defines Queer as a category that encompasses all groups or individuals who reject dominant narratives and negotiate their positions within these narratives similarly according to their shared, marginal relationship to power. Healey, Russian Homophobia from Stalin to Sochi, Preface. I use this acronym literally. The experiences of the people, with whom I spoke, are that of individuals who identify as Lesbian, Gay, Bisexual, or Transgender. I acknowledge that the language used in this acronym and throughout this post is from a distinctly U.S. or “Western” epistemology, but it is a helpful lexicon insofar as I am analyzing objects and experiences that were produced within a U.S. or Canadian cultural-political context. By Hope Wilson, PhD Candidate, Department of Slavic and East European Languages and Culture, The Ohio State University and Randall Rowe, PhD Student, Department of Slavic and East European Languages and Culture, The Ohio State University. Immigrant groups are often treated as though they are the same through and through. It is phenomenally easy to essentialize groups of people, giving ethnic, national or linguistic categorizations value as a diagnostic tool. Discussions of immigrant populations refer to “the Polish,” “the Russians,” “the Mexicans,” “the Italians,” relying upon (artificial and largely arbitrary) national and linguistic distinctions to delineate groups from one another. And from those national groupings, generalizations are made about this “community” of immigrants — never mind that this community might be spread from Chicago to Florida, from Seattle to Nashville, Bismarck to Austin. The national affiliation is used to essentialize them into representatives of a single, unified community. Yet immigrants have historically come from a wide variety of cultural contexts, and they have moved into a wide variety of cultural contexts. Their presence in the locations in which they have lived has shaped the history and culture of their cities, and by their presence they have likewise changed themselves. 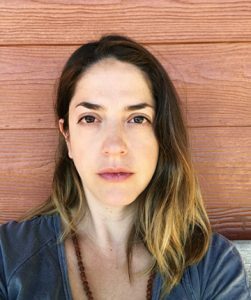 Communities are, after all, local: even though we discuss immigrant communities in essentialized terms, every local iteration of a diasporic group is going to be unique and complex. Of course, understanding local identities and senses of belonging is far from a straightforward task. It is an endeavor that involves sorting out complex webs of cultural contributions and expressions in specific settings. It also is a task that involves an understanding of the local conditions that shaped the community. This project, therefore, is setting out to document representations of Polish culture specifically in the Polish Hill neighborhood of Pittsburgh, PA, focusing on understanding the role that “Polishness” has played in the neighborhood in the past and the role that it plays today. Additionally, we have sought to question how these representations have influenced a sense of belonging or urban identity in Pittsburgh. 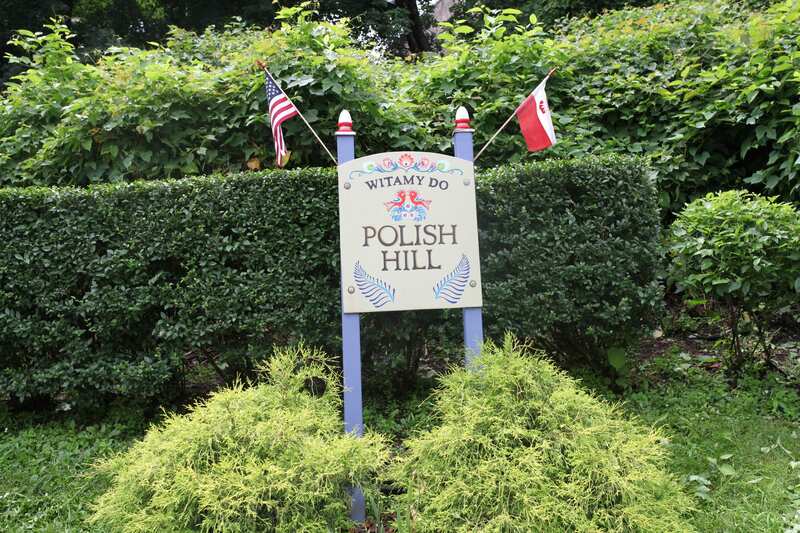 “Witamy Do Polish Hill” – Welcome Sign in Polish Hill, Pittsburgh, PA. Photo taken by researchers on 6/27/18. This is a broad project. Understanding a neighborhood is complex enough that multiple perspectives are needed. Consequently, this project is a joint project between two students on different academic tracks: Randy Rowe (a migration specialist) and Hope Wilson (a linguist). We decided to work together on this project because each of us brings a slightly different background and perspective to the work. Randy’s background with textual analysis and background in migration studies equips him to study the neighborhood from a macro perspective in light of the broader trends in migration, while Hope’s linguistic training is helping her to do a close analysis of the linguistic material gathered from the neighborhood. Our approach is grounded in linguistic landscape analysis (ELLA) (Maly 2016, Blommaert 2013). This methodology examines the presence and use of public written language in order to understand linguistic diversity in urban settings. Because written language posted in public is created with a particular audience in mind, code choice in writing can be a marker of imagined community and civic power in particular locations. The type, placement, content, and code of particular signs in public serve as a record of who uses space and in which ways. Explicitly designed to examine diverse neighborhoods and understand how diversity is a dynamic and shifting process, the linguistic landscape approach will help us uncover what is going on in the neighborhood by analyzing the ethnolinguistic vitality of Polish Hill. At the same time, though, we also want to understand why the neighborhood is this way; consequently, we have also been conducting interviews, which illustrate ideologies and beliefs on identity and a sense of belonging in the neighborhood and surrounding city. Finally, we are also going to examine historical documents. “Free Samples Kielbasa” – S & D Polish Deli, Pittsburgh, PA. Photo taken by researchers on 6/18/18. Based on our initial observations, the Polish immigration to Pittsburgh has indeed shaped Polish Hill in a variety of ways, but it has also shaped the city as a whole. Immigrant neighborhoods often feature restaurants, architectural styles, churches, stores and cultural centers that helped to ease the shock of assimilation after having moved to a new country. Pittsburgh is a city that has seen a change in its demographics since the 1950s due to a decline in its robust steel industry and an exodus of citizens to the suburbs. There are traces of “Polishness” in the originally “Polish” neighborhood, Polish Hill; however, to a large degree, representations of Polish culture have disappeared or been assimilated into a larger urban identity. 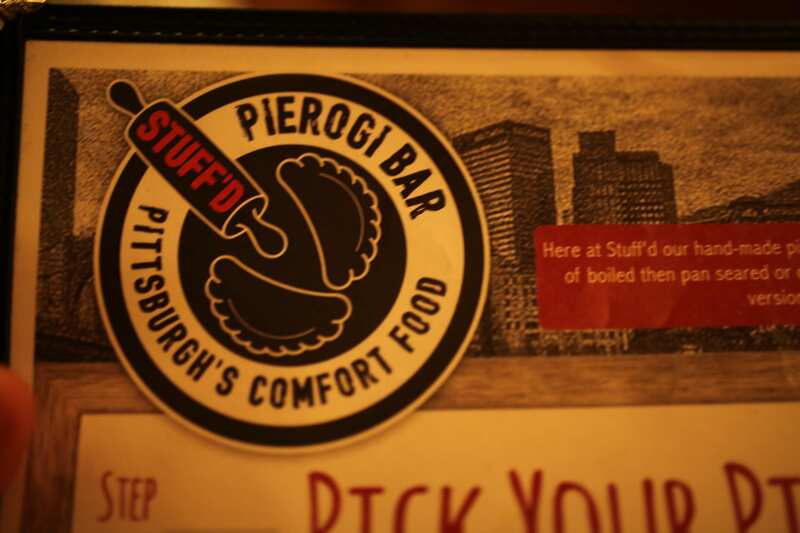 “Stuff’d Pierogi Bar – Pittsburgh’s Comfort Food” Stuff’d Pierogi Bar, Pittsburgh, PA. Photo taken by researchers on 6/26/18. Thanks to a grant from the Global Mobility Project, we have significantly documented the Polish Hill neighborhood of Pittsburgh. The next site for our study will be in another urban Midwestern population center and its historically Polish immigrant neighborhood: Hamtramck in Detroit, MI. When completed, our study will compare the presence of and representations of Polish culture in both neighborhoods. This is an apt comparison because these neighborhoods were centers of Polish immigration during the 19th and 20th centuries; both were located in industrial cities in the so-called “rust belt”; and both have seen their demographics shift significantly in the years since the peak of Polish immigration. We seek to further our understanding of how cooperation and integration amongst communities may be either fostered or hindered by local conditions, as manifested in the linguistic landscape. By Brian Seilstad, Ph.D. 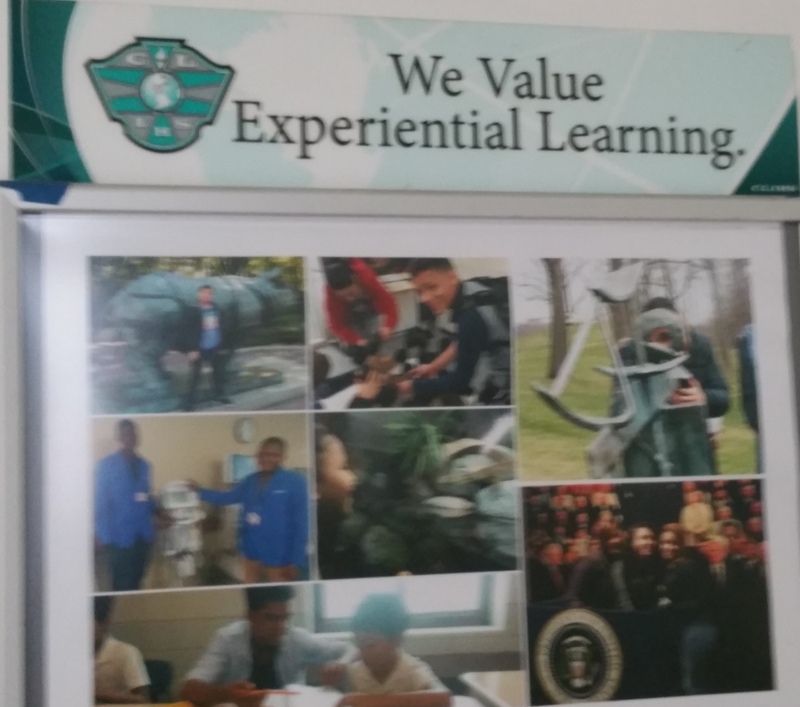 Candidate, Department of Education, Teaching and Learning, The Ohio State University. The changes in the U.S. demographics in the last ~40 years have been dramatic, leading to a more diverse population overall in terms of ethnic, racial, or linguistic backgrounds in addition to distinctions in legal status, transnational aspirations, bi/multilingual identities, etc. Ohio, its urban areas most specifically and Columbus in particular, is among those areas that have experienced these shifts. 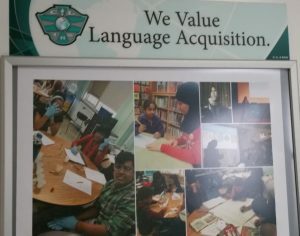 My research focuses on one manifestation of this phenomenon, how the state and city support adolescent newcomers who face intense pressure to master the language and content necessary for success in schools and beyond. This work is primarily ethnographic and discourse analytic, investigating a specific local program, one cohort of students, and the environment and processes of meaning-making designed to support students in and out of the classroom. I conducted my fieldwork during the 2016-2017 academic year and have spent the 2017-2018 year analyzing data and writing the dissertation. Thus, nearing the end of my Ph.D. journey, the Global Mobility Project’s funding allowed me to share this research at two major conferences—Teaching English to Speakers of Other Languages (TESOL) and the American Educational Research Association (AERA)—and to explore a notable adolescent newcomer program model, the Internationals Network of Public Schools, perhaps the most prominent adolescent newcomer programs in the nation. 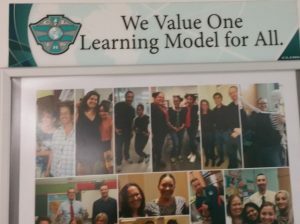 These schools, similar to the local program I researched, serve students from dozens of countries and language groups. At TESOL, I presented a key argument in my dissertation—that the local program reflects an “English-centric” ideology that manifests from the macro-level of the state/national standards, the meso-level of institutional structures, to the micro level of daily classroom interactions. I suggest that this ideology is perhaps an improvement over many “English-only” ideologies and spaces but still often falls short of meeting many students’ needs. In contrast, at AERA, I presented more micro-level data documenting the translanguaging practices of students in the program, focusing on how the English word “chick” is heard by Nepali speakers in the class as a “Nepali bad word” which then morphs into another bad word “chicki-chicki” and blends with the Daddy Yankee song “Shaky Shaky.” I argue that these insights contribute to understandings about translanguaging by moving beyond individual speech events, tracking them across time, and reflecting adolescents’ interest in sexuality, popular culture, and peer relationships. At both conferences, I was pleased to have the opportunity to meet and connect directly with a number of scholars active in this field such as Drs. Holly Hansen-Thomas, Mandy Stewart, Mark Pacheco, and Nelson Flores. 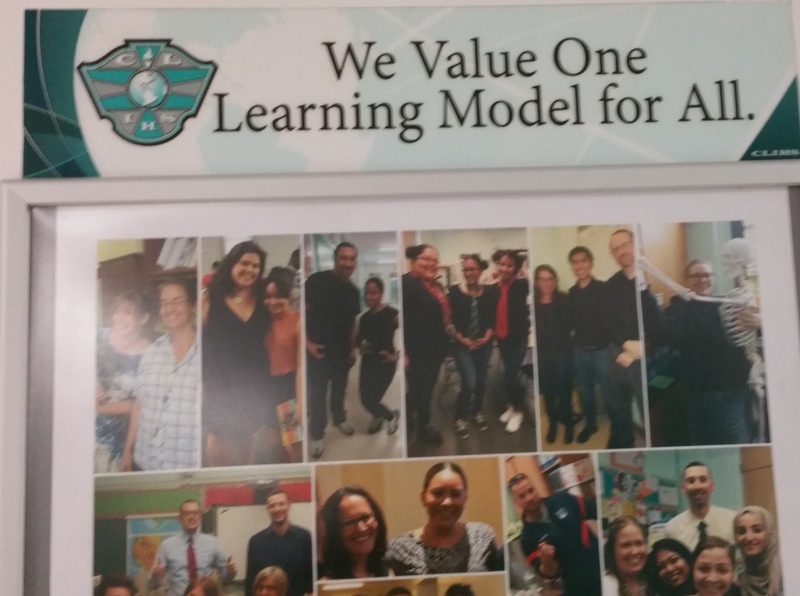 As AERA was in New York City, I had the opportunity to visit Claremont International, a school in the Internationals Network, and the visit to the school reinforced many of the conclusions in my dissertation. Among these is the importance of an inviting linguistic landscape, as evidenced with the school’s and main office’s welcome signs. This is also reflected in the pedagogy of the individual classroom where students are organized by two-year cohorts where the second year students, who have improved their English ability, can help first year students acclimate to the program and academic tasks. During classroom visits, I was pleased to see students collaborating in small groups that changed frequently to encourage different interactional possibilities across the content areas. In a meeting with students, many commented that this arrangement was challenging but supportive through enhanced collaboration and communication across multiple domains. Of course, there are a number of contrasts to the local program and my research. 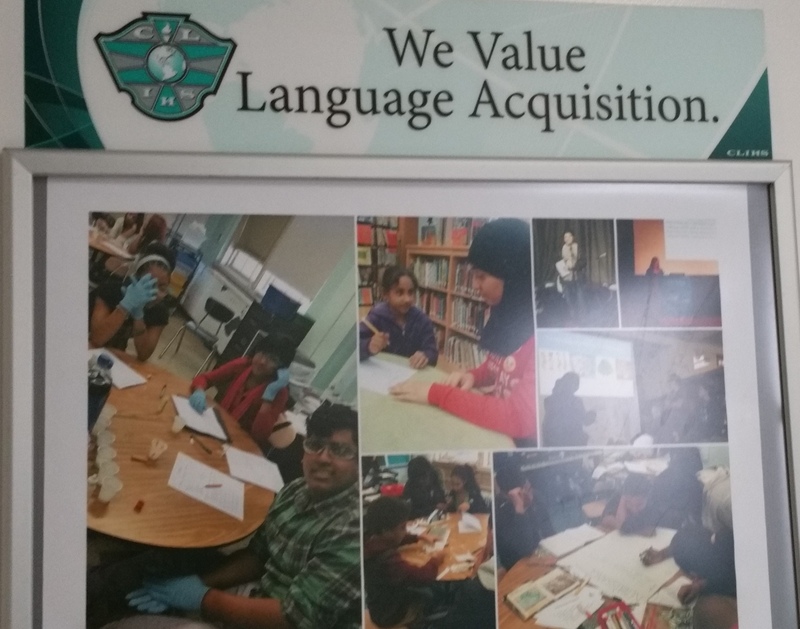 One that remains is to what degree adolescent newcomer programs support and develop students’ home languages. 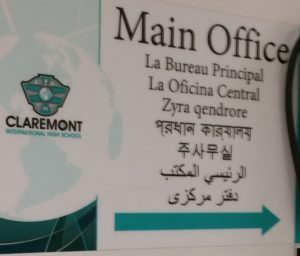 The Claremont program did have a specific course in “Native Language Arts,” but it was unclear to me how many students were able to access these options or what languages were available. My perspective, drawing on my own work and broader reading, is that these programs will frequently leave students behind if their home languages are not directly supported and engaged in the learning process, not only of English but of the home languages per se. 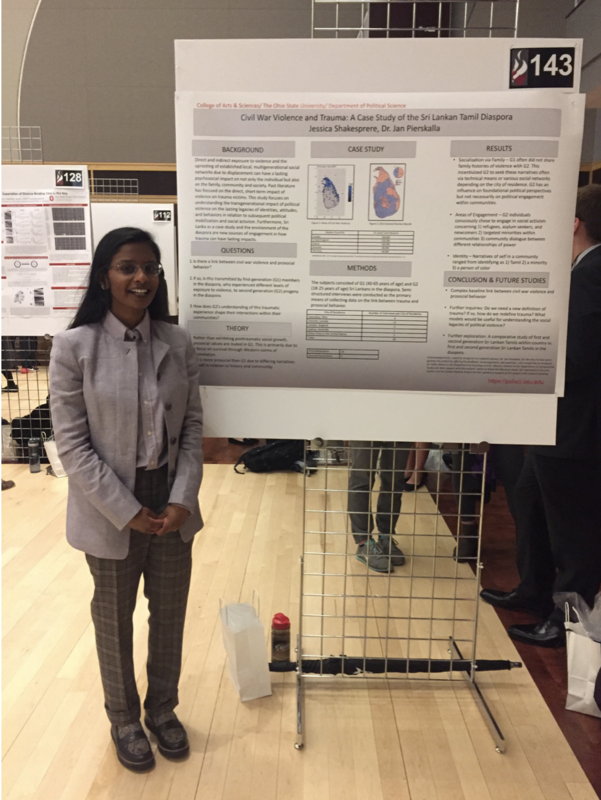 As a senior in the summer of 2017, I was given the opportunity to pursue an undergraduate research thesis with the assistance of Professor Jan Pierskalla in the Department of Political Science. I began my project with an inquiry of understanding the lasting impact of political violence on the psyche that went beyond visible-short term consequences. My background in Political Science and Biology with a concentration in Behavioral Neuroscience helped me understand how trauma is currently being narrated in these disciplines. I became invested in Sri Lanka as a case study as it is an understudied country concerning civil war violence. Moreover, given relatively recent political shifts within the country such as the change in political leadership in the 2015 General Election that “replaced” a government perpetrating state violence, this suggested evidence of political mobilization among Sri Lankan Tamils following the war. The diaspora is a new source of engagement in how political violence can having lasting impacts in new, foreign geographical spaces. 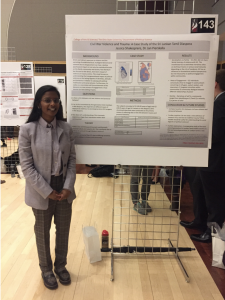 To this end, I became interested in exploring the transmission of political violence across identities, attitudes, and behaviors in relation to political mobilization and social activism in the Sri Lankan Tamil Diaspora. This study aims to add to the existing literature on large-scale traumatic events and their lasting impacts on individuals across generations as well as inform readers on how to understand and describe the complex effects of trauma. This understanding of trauma is crucial for domestic and international efforts to effectively address the psychosocial impacts of trauma in post-war societies. In order to study the possible link between direct exposure to violence and prosocial behavior, my specific goals are to 1) determine if civil war violence has an effect on prosocial behavior in second-generation Sri Lankans in the Western diaspora 2) unpack the mechanisms of transmission of civil war violence to sociopolitical engagement, and 3) determine if contextual factors such as the size of the local community or density of social networks in the diaspora condition this relationship. Through the course of this project, my main focus is to understand how this trauma affects second-generation offspring. Thus far, my research illustrates that individuals do not process or perceive trauma in a linear way such as via varying levels of exposure to violence. Rather, narratives of self in relation to history, community, psyche, and cosmos shape the present context of second-generation Sri Lankan Tamils in the diaspora. As a result, there are various reasons, some factors deriving as an effect of a traumatic experience, that lead to an individual’s sociopolitical engagement in their community. Due to the generous grant sponsored by the Global Mobility Project at The Ohio State University, I helped advance my project by obtaining and accessing relevant archival data on political violence and trauma during the Sri Lankan Civil War. Moreover, I was able to connect with Dr. Daya Somasundaram, a senior professor of psychiatry, consultant psychiatrist, and leading researcher on trauma studies following the war in Sri Lanka. I was also able to conduct qualitative interviews with participants both within Columbus, Ohio and Toronto, Canada, the latter city holding the largest number of Sri Lankan immigrants from the diaspora. Through this, I was able to gain a diverse sample of participants but also hear from a multitude of perspectives in the diaspora. I have the utmost appreciation for the team coordinating the Global Mobility Project, and I am excited to see the progression of this project as I continue my research. In the United States, Spanish speaking persons have a higher risk of being diagnosed with type 2 diabetes mellitus1. Previous studies have examined health outcomes in relation to familismo on Spanish-speaking diabetic patients. However, the research did not determine the interplay of disease management and cultural values. Familismo is a cultural value, that emphasizes the needs of one’s nuclear or extended family over one’s personal needs. This project focused on the process of familismo and the effects of trans-lingual interactions on the patient’s management of diabetes. All participants were Type II diabetic patients and family members living in the same household. The families had two to five members and everyone spoke Spanish. Four families from Columbus, Toledo, Lorain, and Cincinnati Ohio, were interviewed in March 2018. The cities were chosen because of their varied population sizes. In 2016, Columbus had the largest population of 860,090, then Cincinnati with 298,800, Toledo with 278,508 and Lorain with 63,7302. The interviews, which lasted approximately one hour, were round table discussions with the patients and family members. The written questions were shared with everyone and each patient and family member was given an opportunity to address every question. The same researcher conducted the interviews and took handwritten notes of the discussions. A content analysis was done on the themes of the interview. The family’s perception of messages deployed by bilingual members through language brokering, the interpretation and translation of concepts to patients with different cultural and linguistic backgrounds3. The factors that determine which family member serves as the primary support for the diabetic patient. Changes in the family’s health behavior after the patient’s diabetes diagnosis. With two of the families, an adult child with advanced English skills attended the doctor appointments with the patients. They served as patient advocates, ensuring that the diagnosis and recommended changes were understood and carried out by the patient. The other two families only had the patient attend the doctor appointments because one family’s children lived in Mexico and the other family had young children. However, both patients mentioned their husband and one patient’s extended family served as a strong support network for when she was home. For all the families the main support was a family member. Three of the families indicated their spouses as the primary support, although none of the spouses attended the doctor appointments. Two of these families then mentioned additional family members, children and an aunt that also support them through the management of diabetes. One patient relied on her adult daughter who was also suffering health complications. In regard to lifestyle changes, two families shifted their diets to encompass the dietary constraints of diabetes, such as by eating less processed food and fats. For the Toledo family, the patient drastically changed her diet and her daughter also adopted healthier eating habits. Although other family members have resisted most dietary changes, efforts to improve their eating habits continue. The Lorain patient changed her diet and the family reduced unhealthy available foods in the home. To varying degrees, the members of all four families were involved in the diabetes management of the patients. Within the Spanish speaking community, sharing food and meals is an important component of the familial relationship. Having one member not able to participate in this cultural practice can be isolating4&5. Medical professionals should be aware of the family’s dietary practices to best help the patient achieve lifestyle changes that are most effective. The Global Mobility Grant helped fund the travel expenses as well as compensate the families for their time in participating in this project. Dorner, L. M., Orellana, M. F., & Jiménez, R. (2008). It’s One of Those Things That You Do to Help the Family. Journal of Adolescent Research, 23(5), 515-543. Retrieved from https://doi.org/10.1177/0743558408317563. 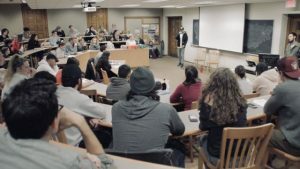 On February 28 and March 1, an Italian rapper called Amir Issaa visited the Ohio State University for a series of events that brought together music and education. Presenting excerpts from his recently published autobiography, and raising awareness on the situation of second generation Italians, students and faculty enjoyed singing along to the lyrics of Amir Issaa. Photo by Erik Scaltriti, Department of French and Italian. Amir Issaa—who usually goes simply by his first name—was born in Rome in 1978 to an Italian mother and an Egyptian father. 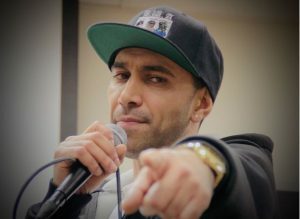 As an artist and an activist, Amir has been a spokesperson for sons of immigrants and second-generation Italians, collaborating with Italian associations such as UNAR (Italy’s National Anti-Racism Union), Il razzismo è una brutta storia (Racism is a bad story), and with the petition website Change.org. Through his artistic skills, Amir has helped the Italian youth by turning anger into creativity, believing that music can be a powerful means of social change. During his career, he recorded six albums, several EPs, and a new record that is planned to be released sometime in 2018. Amir has also been active in Italian cinema, composing the soundtrack for Francesco Bruni’s movie Scialla!, and being the first and only rapper to ever walk on the red carpet of the Venice International Film Festival, where the movie premiered. He was nominated for important awards such as the David di Donatello and the Nastro d’Argento. Amir’s most recent project is an autobiographical book titled Vivo per questo (I live for this), which was published in 2017 by Italian editor Chiarelettere. In the book, Amir describes his life growing up in a working-class suburb of Rome, where he was often subject to racist attacks because of his origins. Amir’s visit was organized by the French and Italian Graduate Student Association (FIGSA), with the support of the Department of French and Italian, the Department of Comparative Studies, the Center for Languages, Literatures and Cultures, and the Global Mobility Project. During his stay, Amir performed a concert before an audience of more than one hundred students, alternating his songs with a Q&A that focused on his mixed racial origins and on the significance of growing up in Italy as a second generation Italian. Still today, children of immigrants who are born and raised in Italy cannot apply to receive their Italian citizenship until they turn 18; before then, they are forced to stay on a renewable visa, and they risk being deported to their parents’ country of origin if something goes wrong in the bureaucratic process. On the following day, Amir led a workshop that focused on how to build a rap song. After talking about his own experience as a hip-hop artist in Italy, Amir explained how hip-hop culture allowed him to express himself in ways that were otherwise inaccessible to young artists. He then asked the audience to start working on their own, original lyrics, helping them to come up with ways to create rhymes while being concise. The multicultural and multilingual audience that attended the workshop eventually generated a song that included lyrics in English, Spanish, Italian, and Turkish. Amir is now back in Italy, after touring the US and bringing his music to US states on the East coast, as well as to California. He is planning on coming back to the US in the Fall for another series of events, and the hope is to see him again soon in Columbus. Amir is on YouTube, Twitter, Facebook, Instagram, and Spotify. …an experimental documentary that explores the life of the inhabitants of Susudel, a small community in the Andes mountains in southern Ecuador. 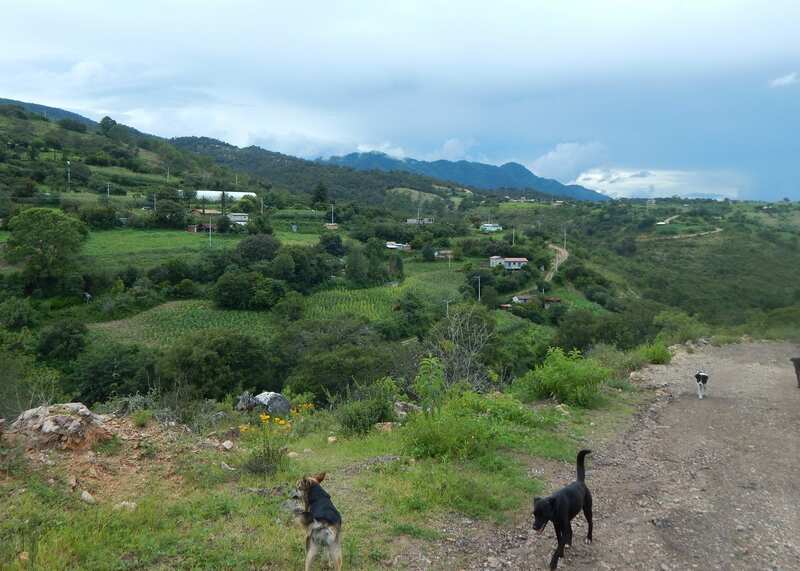 The film addresses the complicated post-colonial legacy of land ownership, labor, and migrations, particular to the region, while simultaneously constructing a portrait of place, which permeates between the exterior landscape and the private/ intimate scape. The New York Film Festival, Solomon R. Guggenheim Museum, Viennale International Film Festival, Centre Pompidou, Palacio Nacional de Bellas Artes in Mexico City, FIDMarseille, Bienal de Cuenca, Habana Film Festival, and BFI Film Festival, London number among venues at which Alexandra’s work has been screened. Alexandra received her MFA in Film and Video from the California Institute of the Arts and her BFA in Photography from Savannah College of Art and Design. 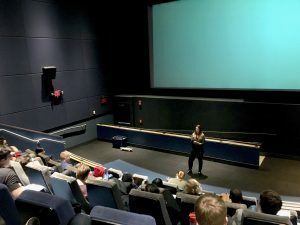 On February 12, Alexandra visited OSU to show three short films and to join Prof. Vera Brunner-Sung of the Global Mobility Project and the Department of Theatre for a discussion on their subject matter. The three films screened were Despedida, Piensa En Mi, Recordando El Ayer. These films depict movement, moments of waiting, separation and life in two distinct places: Los Angeles (Despedida and Piensa En Mi) and Jackson Heights in New York City (Recordando El Ayer). After showing her short films, Alexandra reflected on making films in marginalized spaces populated mainly by migrants. With the support of a Global Mobility grant, I spent five months in Australia studying its histories of foreign policy, Second World War experiences, immigration, and Jewish community. This trip contributes to one of many facets of my dissertation, which examines the postwar lives and migrations of German and Austrian Jewish refugees who were stranded in Shanghai during the Second World War. They had escaped Nazism between 1938 and 1941 to Shanghai, one of the few places in the world that did not require a visa. After the Japanese occupation and the world war ended, the refugees preferred to resettle in Australia and the United States. By examining the Australian path through archives and personal conversations in Canberra, Melbourne and Sydney, the emerging narrative from my research differed from those refugees who departed for the United States. Between Sino-Australian diplomatic relations and the Jewish refugees’ thought processes, Australia, China and the Jews shared a desire in the post-Second World War moment: security. The Australians propagandized a population crisis for national defense; the Chinese sought to expel foreigners who occupied its lands since 1842 and economic rehabilitation; the Jewish refugees desired freedom from persecution. In the National Archives of Australia and the National Library in Australia’s capital of Canberra, I dove headfirst into documents connected to the newly-established Ministry of Immigration, part of the Department of External Affairs, and Australian Legation in Shanghai. After terrifying four years of Japanese invasion in Asia-Pacific including its northwest city of Darwin and growing separation from its mother country, Great Britain, Australia desperately needed to build national security. It was felt that the population must grow—exponentially. A Ministry of Immigration was then formed in June 1945 by Arthur A. Calwell, who served as its minister until 1949. During these years, Australia embarked on a contradictory campaign: “Populate or Perish!” On one hand, it aimed to see the population grow from 7 million in 1945 to 20-25 million by the 1960s. On the other hand, the government and the population, which was 97% white British, wished to maintain the “White Australian Policy”. Since Australia became a federation in 1901, the immigration policy highly restricted entry of non-British migrants including Chinese. This policy effectively led to Australia “being more British than Britain”. The personal papers reveal tensions that Calwell faced in the anti-Communist Australian Parliament and with the anti-Chinese diplomats in Shanghai, the nativist public, and his influential friends in Chinese and Jewish communities in Melbourne. The papers from the Australian Legation chronicled the transformation of its approach to immigration, from cooperation to suspicion, as the staff changed between 1946 and 1949 and conditions in Shanghai worsened, especially for foreigners. In Sydney and Melbourne, I sifted through folders from Jewish Board of Deputies, an overseeing political body of the Jewish community with branches in each state, and somewhat of a liaison between Shanghai’s Jewish community and the Australian government. As the port of entry for many ships from Shanghai, Sydney welcomed over 1,500 Jewish refugees between 1945 and 1955. I walked from the Overseas Terminal in Circular Quay to streets in Central Business District (“CBD”) where the local relief society placed them in hotels. From there, refugees chose to either stay in Sydney’s Double Bay, King’s Cross, and Bondi suburbs or take a long train ride to Melbourne. As part of “populate or perish” campaign, Calwell determined that a “family reunification” scheme needed to be created and many Jews in Australia seized the opportunity, especially in the wake of the Holocaust through the Jewish Board of Deputies, and later local Jewish relief organizations. The scheme allowed only relatives to apply for “landing permits” (entry visas) and thus, Shanghai’s Jewish refugees came through relatives living in Sydney or Melbourne who arrived in the late 1930s. 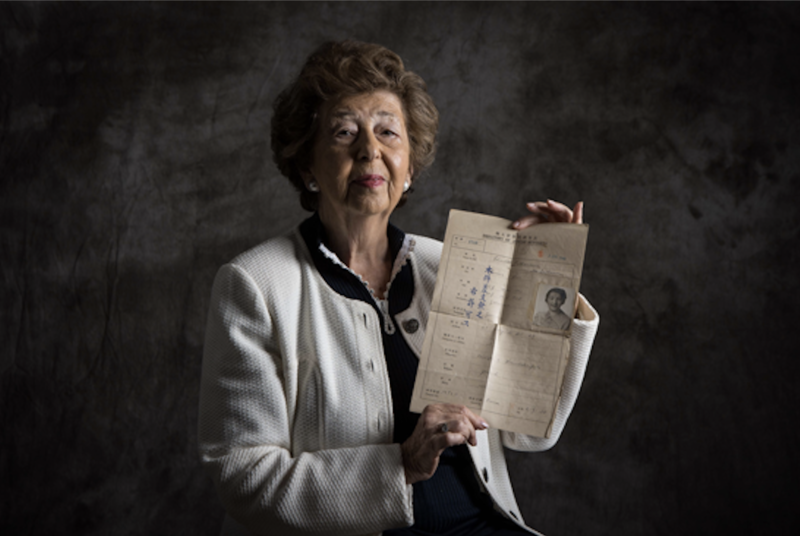 These relatives permitted Shanghai’s Jewish refugees to quickly escape threats of persecution as Europeans from the anti-imperialist Chinese authorities and public. 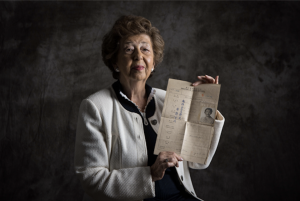 Thousands of other Jewish refugees had to wait for other visas. As I began to listen to video testimonies and read memoirs at the Jewish Holocaust Centre in Melbourne, the “family reunification” scheme resulted in advantaging Austrian and German Jews with birthplace in post-1919 Poland. Unlike the United States at the time, Australia did not impose national quotas. Jews with birth places in Austria or former German territories in post-WWI Poland found planning for surviving family members to meet in Australia easier than anywhere else. A number of families did not “finish” reuniting until the 1950s owing to factors beyond their control, particularly transportation availability in the Pacific in the 1940s. Meanwhile, I searched for surviving refugees and their families through Google and personal contacts. I found Peter Nash and Ilse Charny, volunteers at the Sydney Jewish Museum. Peter invited me to join his weekly tour where he took a small group of Jewish and non-Jewish Australians around. When we entered the newly renovated Holocaust exhibit, he began to weave his family story of survival into the general narrative. He showed us his personal contributions to the collection—a letter of eviction from the family’s landlord in Berlin in 1938 and photos of two children in his extended family who perished in the Holocaust in the beautiful Children’s Memorial. Peter’s devotion to his family history and the story of the Holocaust made him an inspiring guide and person. Although still a teenager in the postwar period, Peter did not hesitate to interview with me at his home in North Sydney. 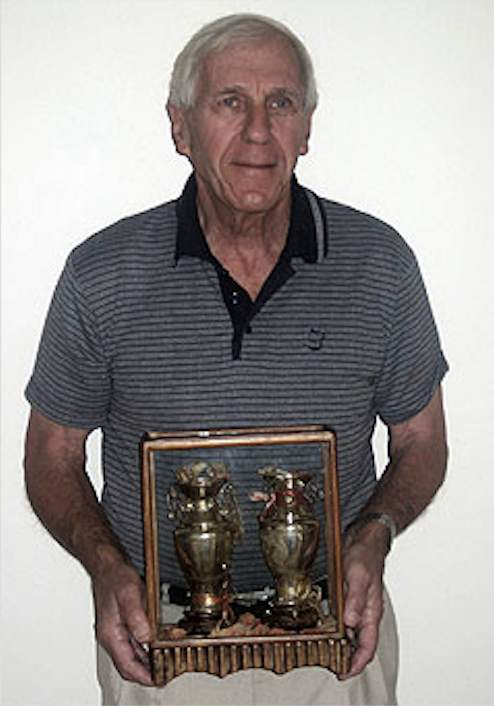 He showed me the beautiful vases, representing friendship, from his father’s Chinese employee (pictured). Unfortunately, Ilse Charny and I ran out of time before I had to depart for Melbourne but she kindly showed me her memoir that she donated to the Museum’s library which I read. 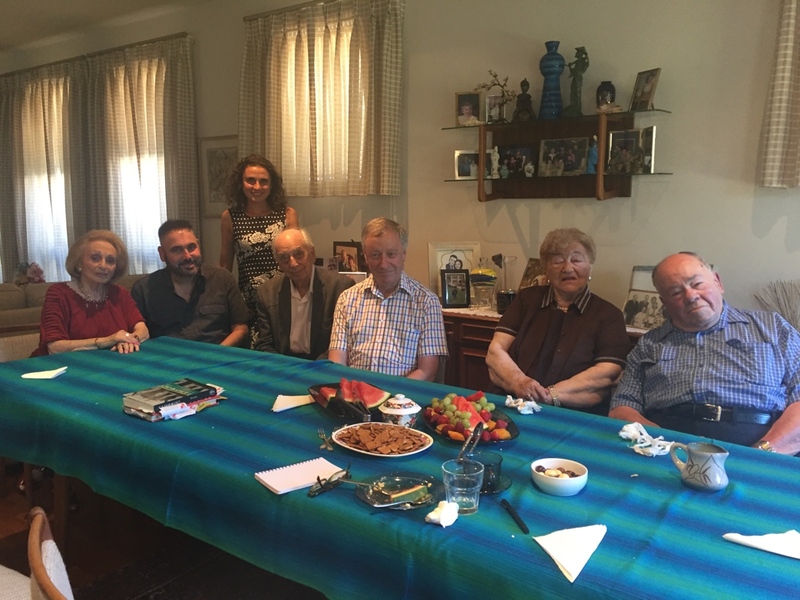 In Melbourne, I spent one Sunday afternoon with a group of Austrian and German Jewish refugees and their families. In the photo, the woman in the far left, Ilse Sherwin (age 91), the man in front of me, Horst Eisfelder (age 93) and the man on the far right, Heinz Wolff (age 84) all escaped Europe for Shanghai with their parents. Security eventually came for Australia, China, and the Jewish refugees. Australia and China eventually enjoy tremendous trade partnership however politically ambivalent with one another. The Australian government collapsed under pressure to gradually dismantle the “White Australian Policy” to allow Asians and other immigrants to enter in the 1950s and 1960s. The Chinese government embraced a positivist view of Jewish refugees’ lives in Shanghai during the Holocaust. For the Jewish refugees from Shanghai, they found security in Australia even if they were forbade to speak German in public in their first years due to antisemitism, anti-immigration, and cultural intolerance. Many have returned to Shanghai to visit in recent years; possibly more likely to do so than returning to Germany and Austria where they experienced greatest persecution. 1 For more on Schrei Abend and its members, see Antonia Finanne, Far From Where? Jewish Journeys from Shanghai to Australia (Melbourne: Melbourne University Press, 1999.